Of all the advice I have given to fellow and incoming college students, I think some of the most valuable has been, "Take CLEP exams." 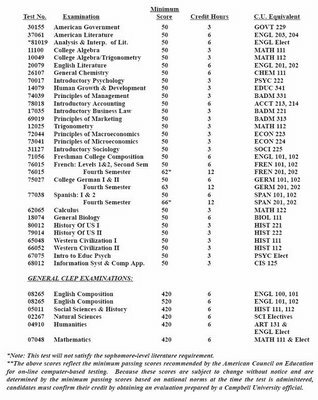 I, and many of my friends, have placed out of English Composition (101 & 102), English Literature (201 & 202), Spanish and French (up to 202) and many other courses as well. Why take years of classes for thousands of dollars when you could take a test to place out of them for under a hundred dollars? "I just didn't know I could," is the most common answer. Well, here it is. Now you know. CLEP is based on the premise that some individuals enrolling in college have already learned part of what is taught in college courses through noncredit adult courses, job training, independent reading and study, and advanced high-school courses. CLEP provides these individuals with the opportunity to demonstrate their college-level learning by taking exams that assess the knowledge and skills taught in college courses. Although this information is up-to-date as of the 2005-2006 school year, it is important to remember that it can change. Campbell University reserves the right to add stipulations to what credit they will and will not accept and it is important for each student to realize that before they take their particular test. Simply ask the registrar about your particular test and they will tell you what they plan to give you credit for on your transcript. First, you need to plan on studying for the exam. It might seem surprising that you should study first, but it really makes sense. It is easy to forget things from classes that were years ago and we could all do for a little brush up on most subjects. The College Board provides an excellent Official Study Guide which I would highly recommend. It covers all of their 34 exams and only costs $25. Although you can also purchase individual test reviews online in PDF form for $10, but these are only sections out of the Official Study Guide and this is not very cost effective. I would recommend just buying the book and sharing it with your friends. You never know when you’ll take another CLEP exam or when your friends might really like the idea themselves. Also, reviewing for your test can be done on your own. Depending upon the subject being tested, use your previous notes from classes, books from those classes, or review materials that are available at the bookstore. The Complete Idiot’s Guide to American Literature, for example, has helped quite a few students review for the American Literature CLEP test and they passed the test the first time. Search for books yourself, ask around and use the Official Study Guide practice tests (already within the book) to test yourself on the material. Second, you need to decide on a place to take the exam. There are over 1,300 testing locations in the United States and Campbell has a new locations nearby including Fayetteville State University, Methodist College and Barton College. 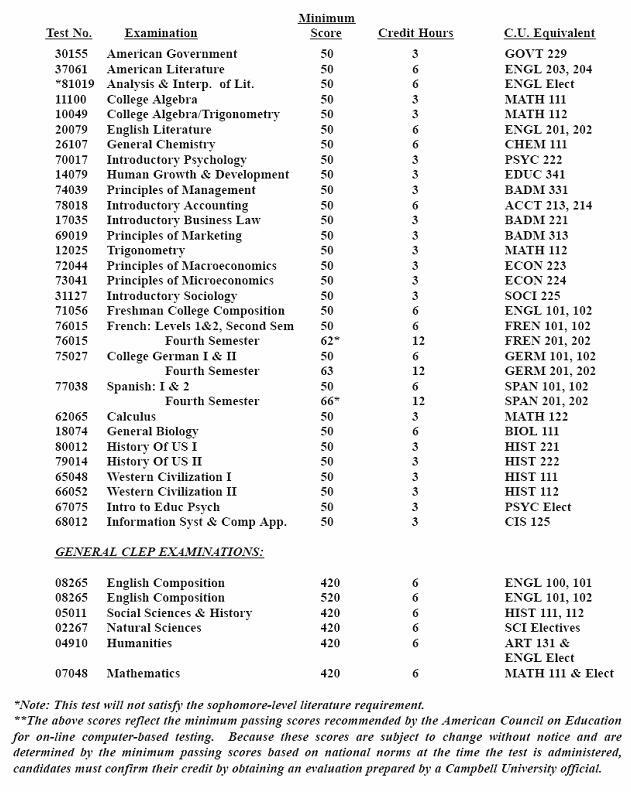 For a full list, visit The College Board website and serach CLEP Test Centers. Once you decide on a location, call them and ask them about what days they provide testing. Usually a CLEP test requires 2 to 3 hours to complete and most offices are open atleast 2 days a week. Decide on a day and time to take the test and then reserve your spot with the testing center. For Fayetteville State you will need to use the following form to reserve your spot. Congratulations, you are now ready to take the test! Finally you will arrive at the testing center. Here you will get a little paperwork to fill out in registration for the test and you will also have to pay a small fee. The examinations cost $55 each and the testing center will likely charge around $10 for processing. After filling out this information and paying for the test, you will be led to a computer and allowed to begin on your test. Again, expect around 2-3 hours depending on which test you are taking. It will be self-timed and will conclude with a single question, “Would you like for this test to be scored?” If you feel like you received the required score to pass the test, feel free to click “heck yes.” Then the test will be scored automatically and you will be notified of the result. If you select “no”, the test will not be scored and Campbell will receive no notification of your result. CLEP testing is a great way to receive credit for what you already know and I hope you all enjoy it. Good luck and tell your friends!